There have been rumors that Marvel Studios has been going to turn Greg Pak’s hit comic saga Planet Hulk into a movie for years. It’s also been tied to Avengers: Age of Ultron, the Guardians of the Galaxy sequel, and now Thor: Ragnorak, too. But why are people obsessed with Planet Hulk getting a movie, when there are other, more appropriate Hulk stories available? It’s not to say Planet Hulk is bad. It’s not! At all! But turning the Hulk into a space gladiator who becomes king of a planet isn’t really a Hulk story. It turns the Green Goliath into a cross between John Carter and Conan the Barbarian; it doesn’t say anything or teach us about the Hulk itself. He never even transforms into Banner during it! Essentially, you could tell this exact same story with a different protagonist and not need to change a thing. Luckily, since The Incredible Hulk’s debut in 1962, there have been many tales that do a much better job at examining the Hulk as a curse, as a monster, as a hero, and as an integral element of Bruce Banner’s humanity, too. Here are six stories, classic and new, that would make more sense as Hulk’s next solo cinematic outing than Planet Hulk. This saga by Bruce Jones and John Romita, Jr. puts the focus on Bruce Banner, whose Hulk is his dark side. After the Hulk is blamed for the death of a young child during one of his rampages, Bruce Banner goes incognito and begins hitchhiking across the country, much like in The Incredible Hulk TV show. As he travels, he has to contend with a mysterious organization chasing him, assassins, a supernatural threat and his own guilt over what he might have done. Not only is it an excellent look into the character of the Hulk, but the supernatural aspect helps buoy up the Hulk’s monstrousness—a new area for the MCU to explore. Peter David wrote the Hulk comic for nearly a decade, and a lot of those comics are excellent. But perhaps the most easily-translated-to-film would be his first story which pits the Hulk against one of his best foes, the Leader. When the gamma-irradiated evil genius steals a few gamma bombs for experimentation, the Hulk and his few friends try to stop him while the military continues to hunt him down. The best part about this story is that David uses the story to force readers to wonder who is being most monstrous—the bad guy, the Hulk, or the soldiers who are willing to sacrifice others to finally get the Hulk. Heck, even Bruce Banner has a few dark moments, as his cold rationality pushes Betty Ross away. Also, there are plenty of other monsters to fight, including men who become monsters willingly just to kill the Hulk. Now that’s some good parallelism! The popularity of Planet Hulk as a movie is especially baffling if you’ve read its immediate sequel, also by Greg Pak. It’s like the Hulk’s version of Civil War, except on one side is the Hulk and on the other is every superhero who screwed him over (by shooting him into space, but also seemingly killing his space queen wife—long story). The point is this smart but still very angry Hulk returns to Earth with his space gladiator friends and proceeds to absolutely annihilate Iron Man, Dr. Strange, Black Panther, Mr. Fantastic, and anyone who gets in his way. Without Planet Hulk first, certain things would need to be changed, but it would still be narratively easy for the MCU’s big shots to believe sending the Hulk somewhere safe, against his will, is a good plan. That’s really all Hulk needs to be furious. Plus, who wouldn’t want to see Hulk crush Dr. Strange’s hands while he’s in the astral plane, because the Hulk’s anger is so insanely huge it transcends dimensions? No one, that’s who. Not everything in this storyline by Peter David would work in an MCU Hulk movie. In fact, a lot of the more obscure Marvel characters and motivations for the bad guys would need to be jettisoned. But its basic story—Hulk lands on Monster Island, where he has to battle friends, foes, and lots of monsters—would be a phenomenally entertaining film by itself. All it needs is the same reveal at the end—that scientists are using the island to test a weapon that turns imagination into reality, a la Shakespeare’s The Tempest and Forbidden Planet—and you have a movie about Hulk essentially fighting his own inner demons… who happen to be a fun variety of superheroes, supervillains, and huge, awesome monsters. It’s a can’t-miss. The legendary John Byrne only wrote eight issues of the Hulk before an argument with Marvel brass ended his tenure, but those eight issues are still some of the best, and they have a fabulous premise: What if someone managed to separate Bruce Banner and Hulk? As it turns out, Bruce is thrilled—he even finally feels safe enough to marry Betty Ross—but the Hulk loses his humanity, and becomes the monster he’s always been feared as. Byrne wasn’t able to finish his story, and his ideas for the comic were apparently pretty crazy, and definitely too bonkers for the MCU. However, the basic crux is that the only way to stop the Hulk was for Banner to merge with the Hulk again. 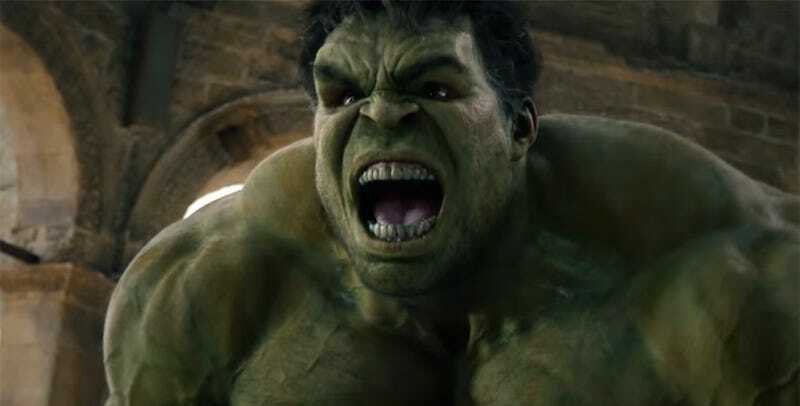 A movie where Banner actually fights the Hulk is gold by itself, but one where Banner must also willingly give up his freedom and happiness to save the world from the Hulk? That’s, well, double gold. When Marvel NOW gave its heroes a soft reboot, Bruce Banner was suddenly working for SHIELD, much like he’s been doing in the MCU. The main difference is that Banner had made a sort of peace with the Hulk, and the fact that he was just going to Hulk out sometimes. But SHIELD could make sure that when that happened, the Hulk would take out his rage on a worthy target (i.e., supervillains). Eventually, thanks to some of the chrono-shenanigans that Marvel is so often beset with, the Hulk found himself joining SHIELD’s T.I.M.E. division (Temporal Irregularity Management and Eradication), which meant he also started fighting bad guys throughout the history of the Marvel universe. To be perfectly honest, I have no idea what the overarching plot of a Hulk: Agent of SHIELD movie would be, but I don’t even need one. I just want to see the Incredible Hulk punching a dinosaur on a movie screen, please.